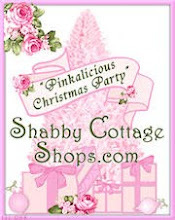 Shabby Cottage Shops: Enter our "Christmas in July Giveaway", at Shabby Cottage Shops!! 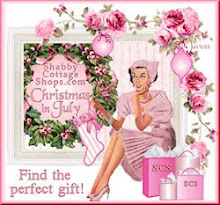 Enter our "Christmas in July Giveaway", at Shabby Cottage Shops!! NEW COTTAGE CHATTER!!! WE HAVE TWO NEW FRONT PAGE MEMBERS!! Please welcome Little Luxuries of Virginia and Holly and Glitter. 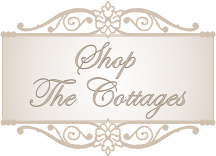 Make a special point to stop by and welcome them to Shabby Cottage Shops during our "12 Days of Christmas in July"! Holly and Glitter is in our new "Christmas Cottage" and you'll find Little Luxuries of Virgina in the Horse Drawn Carriage! Pictured below are the items donated from each participating boutique during our "Christmas In July Giveaway"! This giveaway is totally separate FROM our "12 Days of Giveaways", so be sure to enter THESE HERE TOO! The lucky winner will be announced on July 25 at 12 Noon, EST here, on facebook and twitter. If you share this post on facebook, you will receive an additional opportunity to win. Just email us stating you posted it on your wall, along with the link letting us know you shared it!! Thanks!! Enjoy another entry if you share this post on your facebook wall, leave another comment, letting us you shared it on facebook (this is not required to participate, but will give you an additional opportunity to win! Leave us a comment after you have received your "Christmas In July Giveaway" and let us know how you are enjoying your gifts from the wonderful boutiques at Shabby Cottage Shops! That's it!! Now sit back, have a glass of iced tea and enjoy!!! Hand painted “Cottage Charm” wooden wall plaque. Plaque is thin wooden board, painted a creamy white for the background, and has pink roses and mossy green leaves and pink lettering, all hand painted. Measures approximately 5” x 9” and hangs from a silk ribbon. I just loved them when I saw them! This girly pink flowerpot set nestles in a matching tray! Perfect shade of pink...for any romantic decor! Set measures 10-1/2" x 3-3/4" x 4" high. Each post has drainage holes, they are 3" in diameter. This lovely hand painted glass heart is simply just gorgeous! Painted with pink French Roses and touches of light blue wildflowers, accented with rhinestones and tied with a double satin ribbon is certain to add that touch of romance anywhere you hang it! A fabulous Valentine’s Day Gift and one that can be appreciated all year round! Each ornament is a one of a kind work of ark and comes signed. Perfect for your romantic shabby chic cottage! This festive peppermint candy ornament “Peppermint Cheer” is crafted with silky red satin and a delightful frosted organza. The topper features red organza ribbons, candy cane ribbon and snow kissed accents. Match it with a candy cane Christmas tree or fantasy land decorations! Holly and Glitter ~ NEW SHOP!! #HA362 Happy Halloween Black Cat Garden Flag Dress Up Your Fall Garden By Adding Our Happy Halloween Black Cat Garden Flag... Detailed with everything you would expect for a festive Halloween with the black Cat, Crow, pumpkins, bat & a full moon! The moon & pumpkins are accent with colorful gold & orange sparkles. This flag is made of a denier polyester and is ideal for outdoor use. Match with our larger porch flag for a coordinating look this fall. 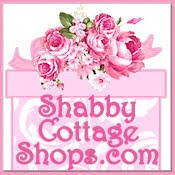 18" x 12-3/4"
BE SURE TO STOP BY SHABBY COTTAGE SHOPS FRONT PAGE AND VISIT Holly and Glitter in their beautiful new Christmas Cottage, right next to Sweetheart's Nest!! 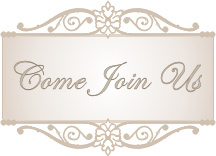 Little Luxuries of Virginia ~ NEW SHOP!! Our goat's milk soap is handmade in Virginia using local goat's milk and it's a wonderful blend of Castor oil, coconut oil, goat's milk, olive oil, palm oil, palm kernel and sunflower oil. Approx. 4 oz. You'll receive one bar of each fragrance: Tranquility, Jade, Lotus Blossom and Prosperity! You'll find Little Luxuries on the front page of Shabby Cottage Shops in the "Horse Drawn Carriage" next to The Ruffled Rose! Be sure to stop by and visit their lovely site! This set of darling dog "Salt and Pepper Pooch Shakers" are a delightful addition to your table set! A pair of Sweet Victorian Pink Birdhouse ornaments with a touch of German Glass glitter to add that extra sparkle Swarovski Rhinestones for a little glamour and glitz. The pictures do not do these justice. They will certainly add the perfect touch to your pink holiday Christmas tree. Display it year round as a stunning conversational piece. The roof has been hand painted a soft pink, adorned with pink roses, German Glass Glitter and comes ready to hang with a pink organza ribbon hanger. This one-of-a-kind hand ainted sign has been graced with pretty pink roses, sprigs of holly, and pink lettering, all set on a background of soft pink. It's been "sugared" with crystal clear glitter, giving it an old-fashioned charm. A pretty white bow adds the finishing touch. Measures 12" x 5¾"
This beautiful, one of a kind hand painted plate by Suzanne, at Shabby Cottage Designs sets a striking look with the raised edge detail of a gorgeous French style scroll work. This French scroll detail sets a beautiful frame for the lovely hand painted design of a cluster of pretty pink cottage roses so perfectly complimentary to the overall design. Just the right piece for displaying in an easel or to incorporate into a wall grouping. This will make a charming addition to your home and a special gift just for you, or even a special gift for that dear friend or family member in your life. This piece measure 8 inches in diameter and is sealed for lasting protection. A one of a kind piece.. This is a beautiful pillow adorned with ribbon embroidery in all the soft and pretty hues as the roses in the fabric....Added is a sweet blue silk ribbon bow and a vintage rhinestone button. Pink Felt Birdie Pin Cushion, is Handmade with Felt, embellishedwith Felt Flowers with Beaded centers and Leaves. The base is constructed of bark cloth with Pink Roses, stuffed with fiberfill, embellished with tiny lace and Pearls. to easily hold your tea and favorite cakes or cookies. Set is accented by pretty roses and gold trim. Green metal "Merry Christmas" rack holds three beautifully detailed decorative plates depicting traditional holiday scenes. For decorative purposes only. 27" x 2 1/2" x 15 1/2" high. 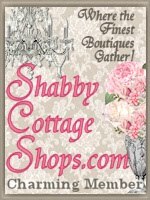 Shabby Cottage Shops ~ Two $50.00 Gift Certificates to be redeemed at any two of the above participating shops. Must be redeemed within 60 days, or will be null and void! Hope you have enjoyed browsing all the lovely items our shops have to offer. Please remember to ask if they offer layaway, as some of them do offer this service, free of charge. Check with the specific shop you may have found something you just can't do without for "Christmas In July" Thanks for stopping by today! 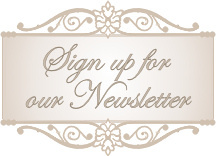 Please email with any questions you may have or need special assistance, we are here to help with your every desire. There is absolutely NO WAY in the world to pick a favorite shop...they are ALL stunningly beautiful!! I'm especially drawn to the gorgeous hand-painted picnic basket, the gorgeous pillows, the beautiful signs, lovely plates and notecards...you get the idea. EVERYTHING is beautiful. Please include me in the drawing. I would feel blessed beyond measure to receive any item of such beauty. My mouth was hanging the whole time. Every single product for the giveaway is beautiful! I love them all. Someone is going to have a huge smile soon. How generous of all these talented ladies. I cant believe the beautiful items in this giveaway.I want to buy some of them right now. (I probably will too. )I look forward every week shopping at the boutiques.These talented women make it too hard to have a favorite.My daughters wedding is coming up in September.I already purchased things for it and will till time runs out.I will never shop anywhere else for gifts anymore since finding shabbycottage shops.Please enter me in Your Christmas in July contest.Thanks so much,Lisa k. Off to shop now! I love, love, love all your stores. 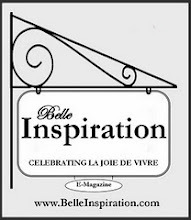 If I have to have a favorite it would be "Bella Lucille" who is donating a very nice wooden wall plaque. I am very into recycling the old to create something new and they seem to do just that. I loved all their items, but especially the canvas prints and collages. I would love to be entered into this drawing. I just shared on Facebook - not sure how to show that but I was glad to share with my friends. 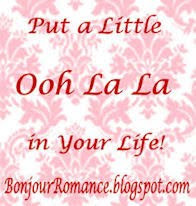 I have also put this event on my blog at www.lilbitoldlilbitnew.blogspot.com. This has to be the best prizes I have ever seen in one basket at a time. Your girls have really out done themselves. I just put this post on my Facebook wall. The link is below. Thanks again for the opportunity! I have signed the news letter and am following the blogs now and on my way to the shops to look at each persons things. I am in love with the store called Debi Coules Romantic Art. 1. Katies pillow is adorable. So Chic and Lovely. 2.Belle Lucille's Cottage sign is so gorgeous with the hand painted flowers. 3. Chloe's pots are so cute in a row of three with the words on it. 4.Debi Coules orginal hand painted heart ornament will be treasured for years, by the winner. 5.Dusty Oak Ornaments must have so much fun making these ornaments in all of the colors she does them in. 6.Holly and Glitters new shop's halloween flag would be so cute to put out for halloween. 7.Little Luxeries hand made soap out of goatmilk would be set in my bathroom for guest. 8.Mandy's mudroom's salt and pepper set is so cute. What a cute pair of shakers. 9.Ribbons Roses and More's little birdhouses would be lovely on my bedroom dresser for me to look at each day. 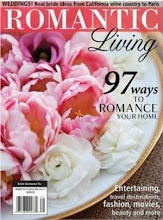 10.Rose Cottage Chic's sign would look so gorgeous over my fireplace for all who enter my home to see.It's beautiful. 11. The one of a kind hand painted plate by Suzanne, at Shabby Cottage Designs is so pretty it would hang in my kitchen. 12.Sweetheart's nest adorable set of magnets would match my red kitchen and look good with my roosters. 13.The ruffles Roses pillow is the most precious of all.This would go on my bed. 14.The adorable bird pincushion would be right next to my sewing machine. 15.Verdigris and Ambergris's gorgeous teaset would be how I would start my day off with a cup of hot tea. I would be smiling while drinking it. 16.Vintage to Vouge Shops plate set would be hung above my buffet in my dining room for all to see. How that room would sparkle. 17. Last and not least the two certificates would be spent with more lovelys from each and everyone of these wonderful shops. I hope I filled this out right by letting you know what I like about each prize. Thanks for the chance to win such a breath taking basket of things. Diane W.
All of the prizes are so lovely and I would cherish each and everyone in my home. My favorite shop is Sweethearts Nest. I have purchased gifts for Mother's Day from the site and love the variety of items. I have signed up for your newsletter and I have to tell you I love the colors of this blog and enjoyed reading and browing for a long time on here. Thanks for entering me into such a wonderful giveaway... Ohhhhh Ohhhhhh How joyous it would be to have these wonderful prizes in my home. I would treasure them always. I loved the music choses too. I was sent here by my friend and this is the most adorable blog/site. I love the Shabby and Chicness to it. I love pink as well. I have signed up for the newsletter and am excited to be included in the wonderful daily prizes. My favorite thing from Holly and Glitter is the 12 month tea towel set. Can you believe it? Get one a month. What a neat gift this would be for someone to get. My favorite thing in the Sweet Hearts Nest store is the vintage and lace pink 3 tier cake platter. How delish things would look on this platter. I am in love with the store called Mandy's Mudroom because I have a very spoiled little girl dog called Martini and will love shopping this store. Thanks for the fun.